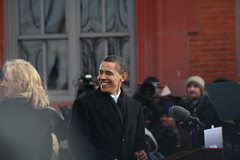 I snapped this image on 1/17/2009 at the Whistle Stop Tour that stopped in Wilmington Delaware. In this image, Jill Biden was posing for a photo op, when President elect Barack Obama turned around for a brief moment and caught some of the glow of the spotlight on the side of his face. You'll see what I mean when you view this in the larger sizes by clicking on the image.